The bus goes along Francisco de Miranda Avenue, one of the streets that crosses Caracas from east to west and runs through three municipalities of the city. It is 10:30 a.m. on a November day in 2017, and there is no traffic. At one of the stops, the bus comes to a halt. He nods his head yes. She and other journalists board the vehicle. Someone raises a cardboard black frame that looks like the television screen. Blue letters read “The TV Bus”. Castillo appears behind the frame, holding a script in her hand. Castillo and her team got onto another bus and read the news again. The TV Bus began broadcasting on May 28, 2017. The same day 10 years earlier, Radio Caracas Televisión, the oldest channel in the country, went off air after the government of then-President Hugo Chávez wouldn’t renew the grant to continue operating. 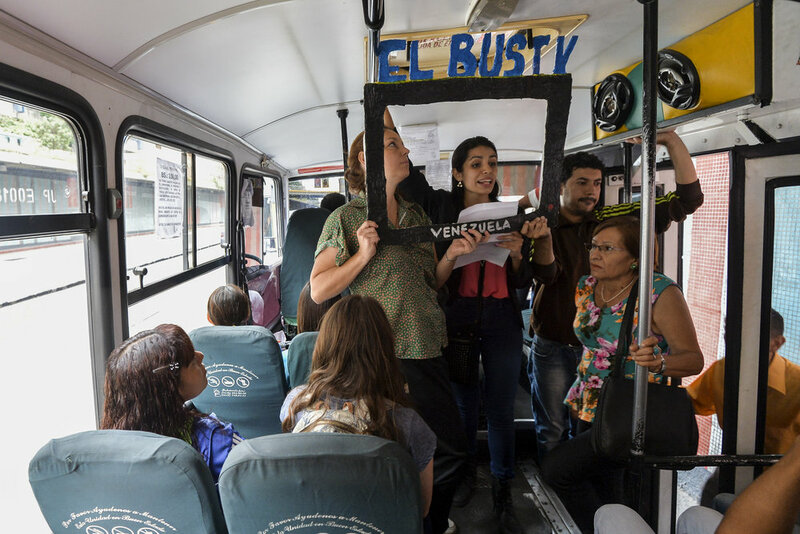 The idea of reading the news on buses emerged when communicators Claudia Lizardo and Nicolás Manzano took a bus after one of the protests against President Nicolás Maduro. On the way, they noticed the passengers on the bus seemed isolated from what was happening around them. “We were surprised that people were living a different reality, they seemed oblivious to the repression that was happening outside,” said Lizardo. They decided another way of reporting had to be devised. Castillo, who wanted to join some form of peaceful protest, found out about the idea and contacted them. They met and refined the idea. The knew civil organizations have documented the closure of 50 media outlets by the government. Although informative portals abound, only 55% of the population has access to the Internet. They sought to break down those barriers by taking the news on the road. Lizardo, Castillo and Manzano were joined by Víctor Rodríguez, María Gabriela Fernández and Abril Mejas, all professionals in communications and journalism. They practiced reading the news in a parking lot, made the frame that would serve as a television screen and hopped on the buses. When their audience on wheels applauded them, they felt they were on the right track. Despite being six months old, The TV Bus has already expanded. Teams have rolled the news on the roads of seven Venezuelan states: Merida, Lara, Carabobo, Anzoategui, Aragua, and Barinas. Now they are working to make the initiative a means of hyperlocal communication. Journalists are training citizens to replicate the newsreel on their internal transport routes so the information is useful, and so the news is genuinely a public service.